I had 12 resident points this year and did not draw 10 early archery. Are there any decent bucks left in unit 21? My non-resident buddy drew a late coues tag in here, I'll be helping and we're hunting last 5 days. I'd be happy to share any info if we see a good muley to anyone who is hunting at that time. PM me and perhaps we can at least get each other's #'s. Thanks guys. That clears it up for me. I don't post often but have been reading for years, always appreciate the good insight here. I do have a question regarding draw odds for those that can help - my situation is kind of complicated, a good test to the draw know-it-alls! Been looking at updated draw odds heading into 2018 on the other sites that offer them. I am now a non-resident but hold an AZ lifetime license. I want to apply with a pure non-resident, I have 11 points, he has 6. That means we average 8.5 but is rounded up to 9 on a group application - correct? 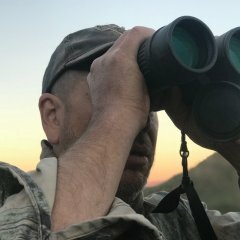 If so, let's say my buddy and I apply as a group for hunt X, and there are 100 tags total available. Up to 10 would be available to non-residents, in which up to 5 of those can now be drawn in the bonus pass. If 4 non-resident tags have been drawn in the bonus pass and our number comes up next, can we draw that tag assuming there are still bonus tags available (to residents)? Will the "pure" non-resident get non-res tag #5 and I get one of the available 15 resident tags left in that round due to my lifetime license status? Thanks in advance for the help. RKen - just the objective or the scope without case? I'm trying to keep this all together, so not sure I would break apart. Archermatt, I texted you via your PM. Let me know. The pants have been sold, thanks for checking. I have some Kuiu Attack pants in verde camo, size 40 for sale. I had another pair of attacks I wore on hunts and I don't believe these have ever seen the field, only washed once before a hunt - they are in like new condition. IMO, the Attacks are one of the best hunting pants out there. $95 TYD. These have been sold. Thanks guys - Cot, lanterns, and buddy heater are sold to First reply via PM. Meeting someone on the TV this weekend for a spot check. Rest is officially still available, sorry if I missed anyone via PM, I was bombarded. I appreciate everyone taking a look. This stuff has to go, make me an offer!!!!!!!!!!! I am in Fountain hills, easy to meet in Mesa area if need be. Take this for what it is worth (may not be much). I've always worn scent eliminating clothing for Midwest white tails, mostly because that used to be the only quality clothing I could find for hunting. Many times, if the deer got downwind it was over. However, I recently upgraded scent clothing, even going a step further with high quality scent eliminating base layers. We do the whole scent free shower twice a day too, but this year I have never had so many deer downwind and not bust me. Had a decent buck and doe bed behind me one morning at 25 yards, they could not have been more down wind. They stayed and slept for 3 hours, it was actually annoying after a while. I've always said its a matter of what is a mature game animal worth to someone, everyone will have a different take on that question. To me, killing a giant with my bow is almost priceless, if the scent control stuff helps just minutely, enough to keep that buck there just long enough, then it's worth it in my opinion. I know the stuff doesn't hurt my chances.